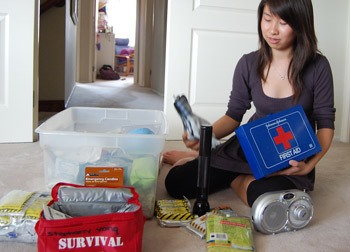 Stephany feels safer knowing her family has put together this earthquake kit. I was pulling my head through a sweater one afternoon last July when the earth started to shake. The lamp in the corner fell in slow motion, shattering into black porcelain shards, while the clock on the wall above it swayed back and forth before dropping to the ground. I stood shocked; I had never been in an earthquake this big. I scrambled downstairs (with the sweater dangling from my neck), clinging to the railing and calling for my mom. She met me at the landing and shoved me into the storage room under the stairs as boxes of detergent and art supplies toppled from the shelves. I held onto her and seconds later the shaking stopped. After a few seconds, we cautiously stepped out of the room and examined the broken vases and fallen picture frames in the family room. For the next 15 minutes, aftershocks sent chills up my spine. Since landlines were down and our cell phones didn’t have reception, my mother and I decided to go to my brother Aaron’s summer school in Diamond Bar to check on him. During the 10-minute drive, we assumed the worst. Were the kids OK? Did they take the earthquake seriously (since school drills are considered jokes) and take cover under their desks? I stayed in the car as Mom went inside to check on Aaron. She reappeared with him a few moments later and said some ceiling panels fell but the kids were fine. We exchanged earthquake stories in the car. When we got home, we inspected the house and cleaned up broken glass. We kept the news on during dinner as the anchor did a rundown on earthquake safety and emergency plans. Our family hadn’t seen the need for a plan because there hadn’t been a major earthquake since the 1994 Northridge quake. As the television screen displayed the list of “must haves” for earthquakes, I was stunned by how unprepared my family was. We didn’t have emergency kits or a plan. What would we do during the weekday when we were separated? In the car? How about when we were at one of Aaron’s basketball games? It was unsafe to be so unprepared with the San Andreas Fault nearby. I examined my room after dinner. My drawers were open and shoeboxes and storage cases from the top shelf of my closet were on the floor. The shelf where I put my trophies was empty since the trophies were everywhere, including on my bed. The sharp edges of a trophy or plaque could have easily pierced me had I been lying in bed. Then I spotted something that I wouldn’t want above my head during an earthquake. The sharp hangers on the large wooden board where I hung my hats were face down on the pillow. That night, I moved the board into the garage. My mom moved the trophies downstairs. Dad moved heavier boxes from the top shelf of my closet to under my bed. My room was noticeably more earthquake safe in less than one hour. The next day, my mom put together four emergency kits, which she stashed in the storage room. Each kit includes bottled water, a radio, blankets, food that resembled hamster food stuck together to make a granola bar, a flashlight and spare batteries. It was reassuring to know we had something in case of an emergency. Within one day, we went from having no emergency plan to having four kits (one for each of us) and I had made things safer in my bedroom. But this is where our earthquake preparation stopped. We still didn’t have a way to communicate if phone lines were down or a designated place to meet if we weren’t at home when an earthquake hits. Just as fast as the earthquake started, our earthquake plans stopped as we resumed our regular lives. Six months later on January 8, I was taking a shower when I experienced the dreadful shaking again. I had that same sinking feeling in my stomach. Making emergency kits and moving stuff had not prepared me for this. What are you supposed to do when you’re in the shower during an earthquake? Horrified and wet, I stayed in the shower holding onto the showerhead until the shaking stopped. Looking back it wasn’t the most intelligent decision. If it had been a bigger earthquake, I wouldn’t want to be next to two large glass shower doors. It never occurred to me get out of the shower and turn off the water. That night the entire family took a few minutes to discuss what to do during an earthquake. We decided that right after it ended we would find a radio or television to hear the latest updates and call each other. If anyone was home, they were to turn off the house’s gas valve to prevent any leaks. If it were during the day, Aaron and I would be at school where we had emergency kits and would be in the care of the school. The main thing we discussed was the need for common sense: glass is bad, getting under a table is good. The kits wouldn’t be useful if you didn’t survive the actual earthquake. This is why having a plan is very important. I recently spoke to Kate Long from the California Emergency Management Agency (click here to read Stephany’s interview with Kate Long). She stressed the importance of earthquake kits and phone lists but also people preparing as a community, which means working with neighbors to check on each other. Once I had done the interview, I realized a missing part of our earthquake plan: we didn’t have a reliable way to communicate after a quake. My family should have an out-of-state contact who everyone calls in case we can’t reach each other (after a disaster, it’s often easier to call long distance). I feel safer knowing my family is more prepared. After writing this article, my family continued its quest to become earthquake proof. We took down trophies, headboards, and other hazardous furniture, but then something didn’t feel right. Sure, we were safe, but our house wasn’t our home. Statues we collected from family vacations and piano trophies I earned when I was 8 were absent from the family room and my bedroom. My mom figured we couldn’t continue to live like this. An old headboard that I took down after the earthquake was restored to its previous position after purchasing special hooks designed for withstanding earthquakes. We used museum wax (that is strong enoguh to hold down a vase without damaging the wood) to secure our vacation memorbilia in our study. Bookshelves and desks were fastened into place with hooks. Reflecting on all the precautions (and changes) we have made to our house in the past month, I realized how much safer we are because of this article. It made me think about how safe we are living in Southern California and how one suggestion to write an article, prompted a domino effect that drastically improved my family’s safety. What to do in an earthquake: an interview with an expert. A City of Los Angeles emergency preparedness coordinator answers Katherine’s questions about earthquake safety. I found this article to be very helpful. Ever since that 4.7 earthquake this month I have been very uneasy. It was the first real earthquake I ever experienced and it was a real eye opener. Knowing how close the epicenter was to my home in San Pedro really frightened me. The night of the earthquake I wanted to go out and buy some earthquake supplies in case the aftershock would come soon. However, with all of the people in my family working or going to school no one ever got around to buying what was needed, I think this is because we didn’t know what to buy. I took it upon myself to go to a nearby grocery store and I bought all the necessary supplies. Thanks to this article I knew what I needed to buy and now I know that I don’t need my mom to do everything for me. Because when it comes to dangerous situations like this everyone has to be prepared.